Here at Shoreline Trotters we are a small family run group that try and cater to everyones needs. Our donkeys are available for both public and private hire for all sorts of events and are highly poular. They can be used for either petting and display, or for childrens rides and fundraising. We are also introducing birthday parties at the donkeys farm! Party games on the donkeys! 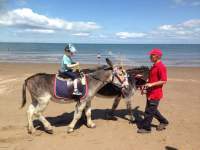 We are also introducing own a donkey session for children. Charity/School fairs/Fundraisers/Shows etc we are happy to arrange a return percentage of takings of the day rather then an upront fee. Shoreline Trotters has full public liability insurance with a riding establishment licence on the Premesis. Our donkeys maximum weight is 10 stone on the larger donkeys, 8 stone on the smaller donkeys. Our donkeys welfare is priority so we reserve the right to refuse rides to anyone who is over our weight limit, and to ANY persons deeming too rough or abusive to our animals or staff with no refund offered if so.